I`m in Bangkok. It came after a long time. Bangkok, The place is not near for me. This time purpose is want the world know for widely. So, We will visit at Press coverage and Government agency with Mr.Saito. In Bangkok is Cloudy and Sultry. No window. When we walk, Became sweat. We were started from Victory Monument. As First, We want to FUJI TELEVISION NETWORK, INC.
Wow! Mr.NAGAMATSU is Good looking Guy! We were talking about PLAJA and our plan. And I took a photo to commemorate with our original T-shirt of World Tsunami Awareness Day. He Will be transfer the working location at Korea soon. Next we visited at Japan Foundation. 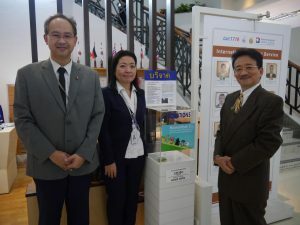 This is our important purpose about cultural exchange for such us Japan and Thai. Japan Foundation was a lot of very good suggestion for us. And Mr.YOSHIAOKA(Director General) also good looking guy too! I`m thinking about PLAJA`s goal and deep emotion too. Because Mr.YOSHIOKA And Ms.TOMITA, Very Kindly talking and have a good idea a lot. Also Mr.YOSHIOKA introduced Ms.NAKAJIMA for us. She have been working about disaster prevention relation. Phuket also before TSUNAMI disaster place. I hope good suggestion for us about disaster prevention relation too. Here also I took a photo to commemorate with our original T-shirt of World Tsunami Awareness Day.